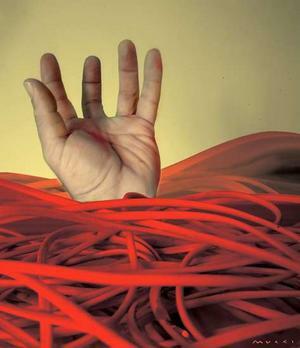 Red tape is an expression used in English to describe excessive regulation that are often redundant or bureaucratic and hinder action or decision-making. The term is often used in context with governmental, state or local regulations but can also be applied to other organizations like corporations. The term is derisive and always implies excessive regulation as well as a lot of hair splitting or foot dragging. The origin of the term is somewhat obscure but there is a theory. Normally I do not bother with obscure theories about expressions but this one is actually quite interesting: Back in the 16th century Henry VIII wanted to get his marriage to Catherine of Aragon annulled to marry Anne Boleyn. Pope Clement wasn’t to thrilled with the idea so Henri besieged him with numerous petitions all rolled up and bound with the traditional red string. Sounds like a good explanations to me.